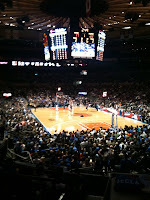 Biting the Big Apple: Let's Go Knicks! It happened for the first time on a late Sunday afternoon in November ... My friend M took me to see my first Knicks game at Madison Square Garden. Not because either of us are basketball fans but because it had long been a common yet unticked entry on our "things to do in New York" list. I had no idea how much I would fall in love with the game, or more precisely with watching this particular team in their impressive home venue - surely one of the best event space I know, managing to be at the same time huge yet almost intimate in the sense that even with seats far away from the court, one still doesn't miss a beat of the action or feel in any way removed from it. I have been to five more games since and each of them only further fueled by new-found passion and I have shared it with different friends every time, eager as I was to share my enthusiasm with them. Sure the Knicks have not played well in years but I must admit that I love everything about the experience, even when they lose ... The grace of the players, who despite their customary 6'9 frame, move around the court with incredible speed and agility, and sometimes the same lightness of step as ballet dancers ... The fact that, in typical American fashion, the game has been turned into a slightly tacky entertainment show with musical interludes being played throughout - along with dancers, cheerleaders, singers, pizza throwing contests, audience 80s dance-offs and usual celeb spotting courtside providing a spot of light relief between periods and during longer time-outs ... That shouting, screaming and singing ("Defence! Defence! 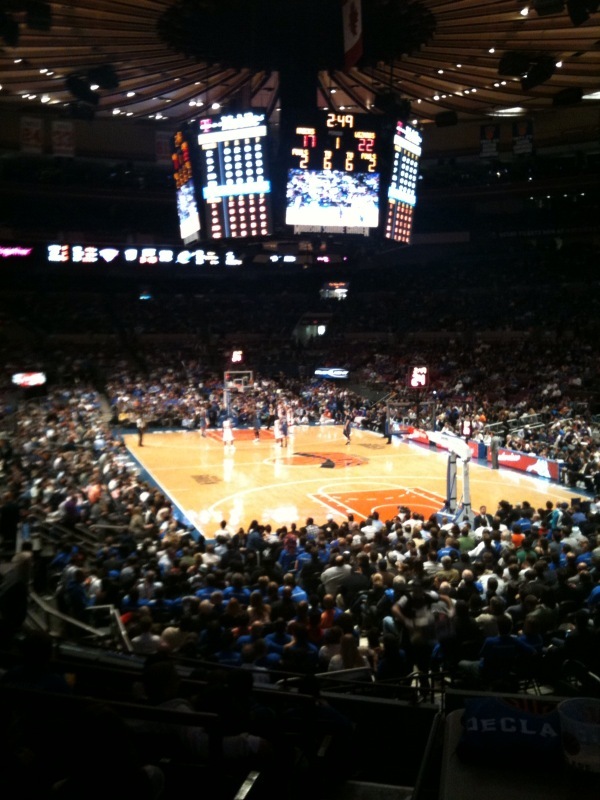 ", "Let's go Knicks!") are generally encouraged in the audience during the game and I unashamedly and liberally indulge in all of it. While it may sound rather distracting from the main reason for being at the game, it's an integral part of the experience of watching basketball at the Garden. I certainly wouldn't have it any other way and I can't wait for the 2010 season to begin! I love reading your blog! I recently surfed the internet enthousiastically under 'bloggers in NYC'.. and ended up here! I couldn't find what brought you to New York, I would love to know! Thanks for your comment. I intend to write a post soon with more practical advice about moving to NYC and settling here, including more on the reasons why I moved. So please stay tuned!